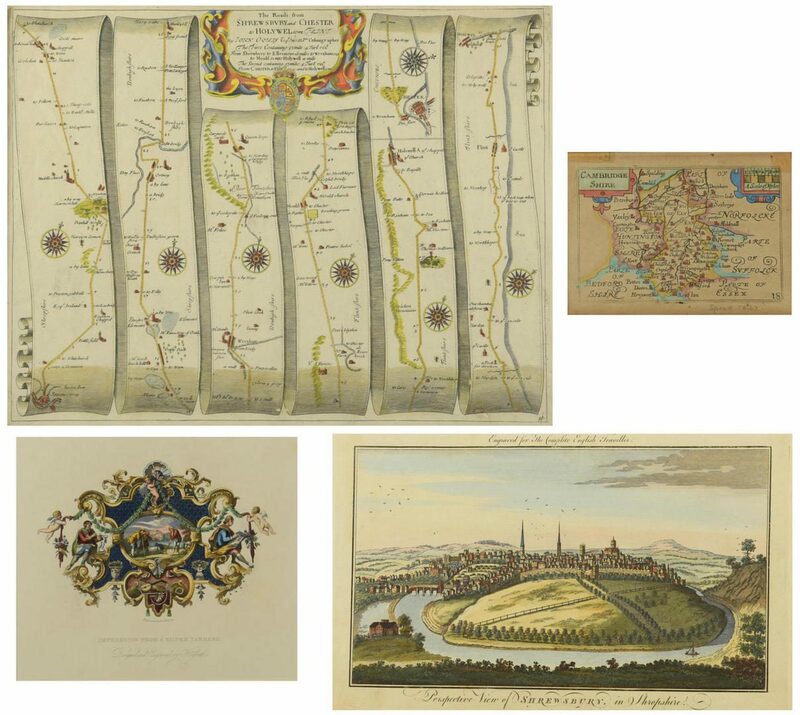 Four (4) English maps and engravings inc. Ogibly, Speed, Chavane. 1st item: "98. 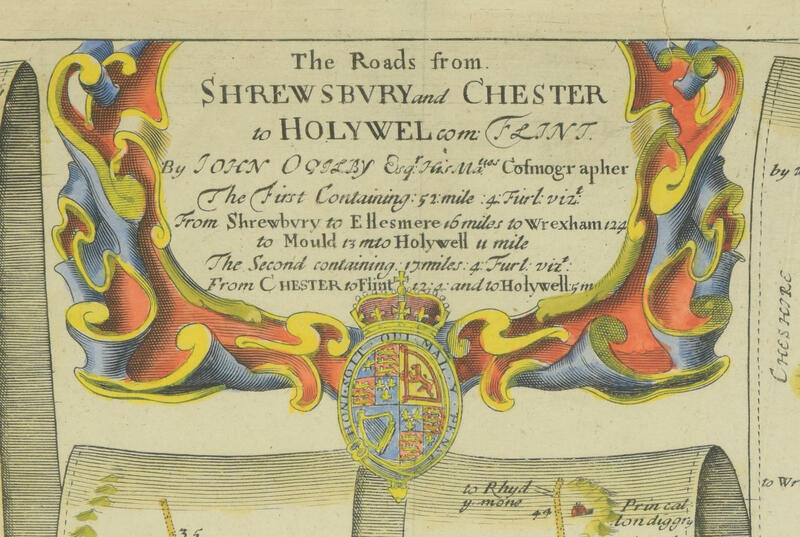 The Road from Shrewsbury to Chester to Holywell Co. Flint. 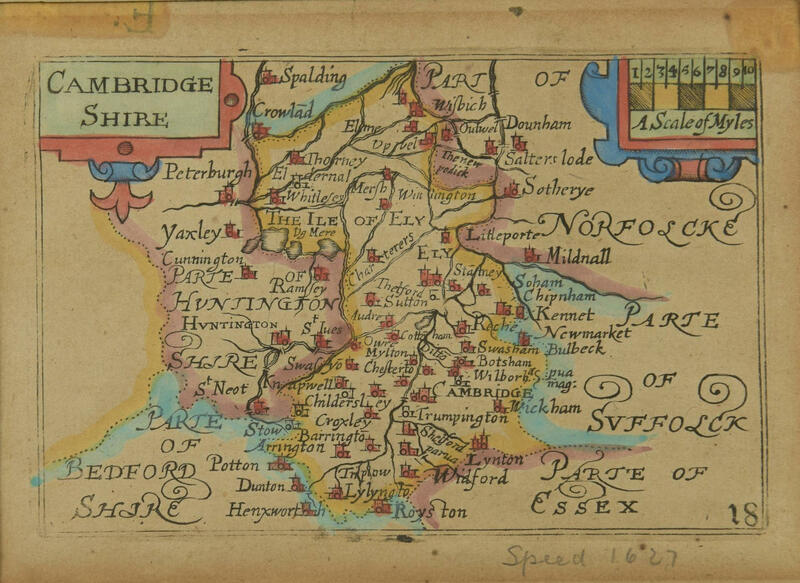 ", by John Ogilby (United Kingdom, 1600-1676), from his "Britannica", 1675. Copper plate engraving with later hand coloring featuring five "strip maps" that depict the roads and landmarks between the towns in the title. 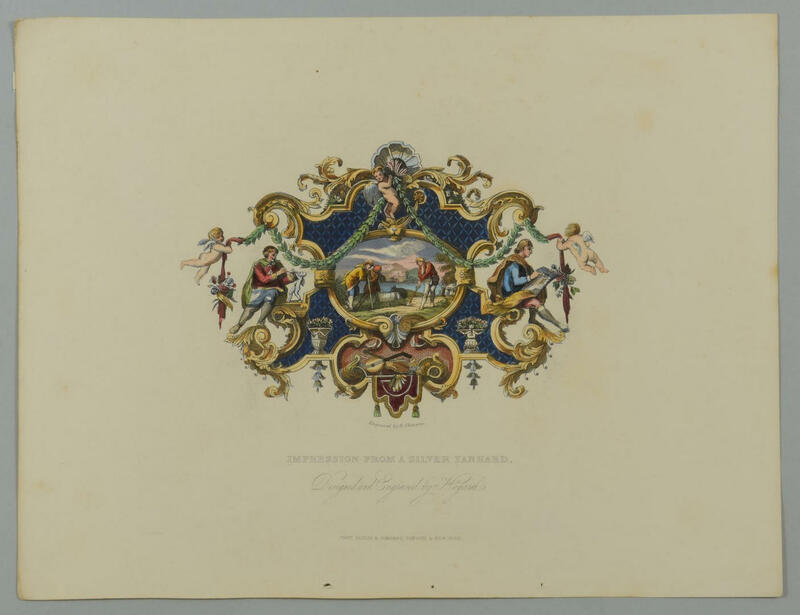 Decorative multicolor title cartouche with coat of arms, top middle. 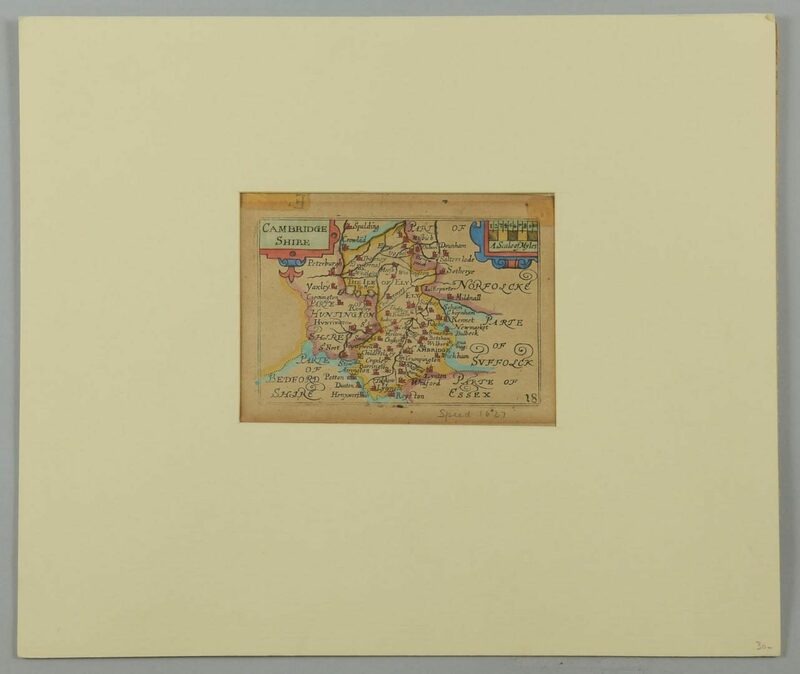 Ogilby information label en verso. 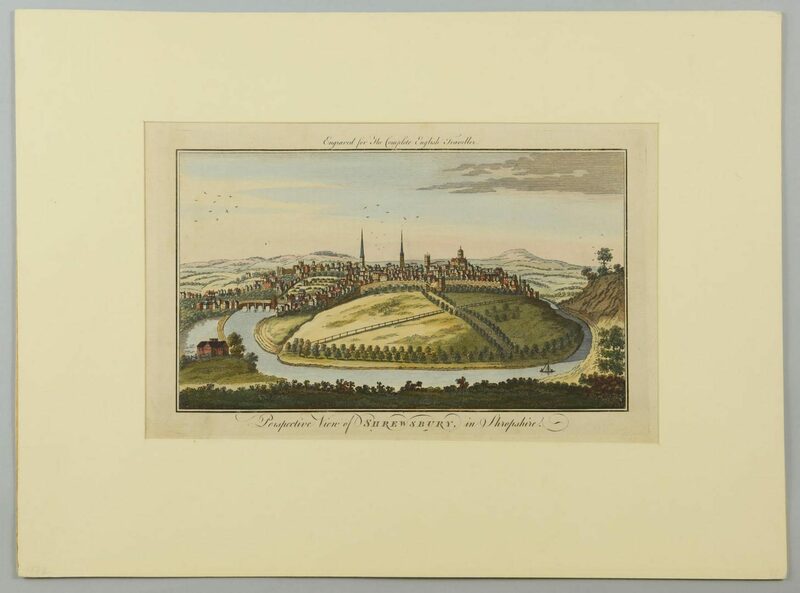 Housed in contemporary wooden frame. Image – 13 3/8" H x 17 3/8" W. Plate – 13 3/4" H x 17 5/8" W. Framed – 16 7/8" H x 20 5/8" W. 2nd item: "Cambridge Shire", by John Speed (United Kingdom, 1552-1629), circa 1627-1646. 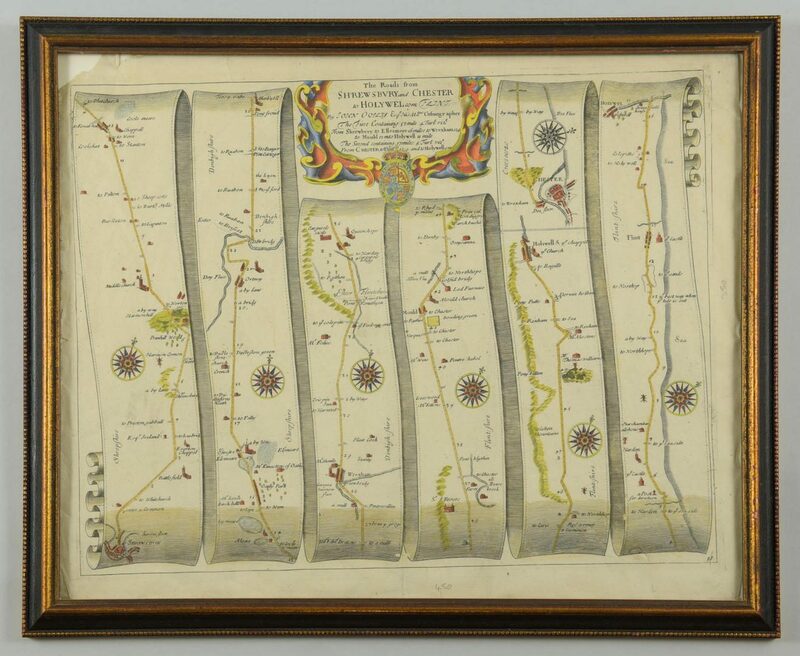 Copper plate engraving with later hand coloring based on a larger map by Speed which appeared in his "England, Wales, Scotland and Ireland Described and Abridged…", published by Georg Humble, London, 1627-1646. 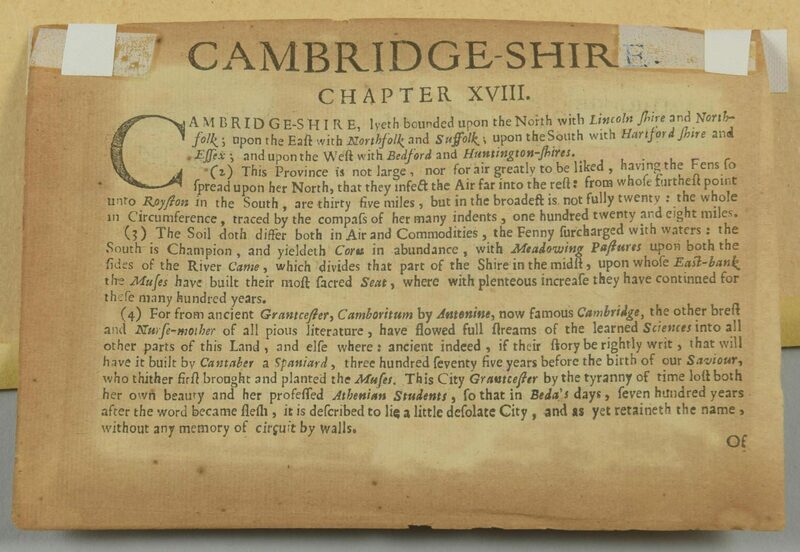 "Cambridge-Shire" text page en verso. Mounted to matte. 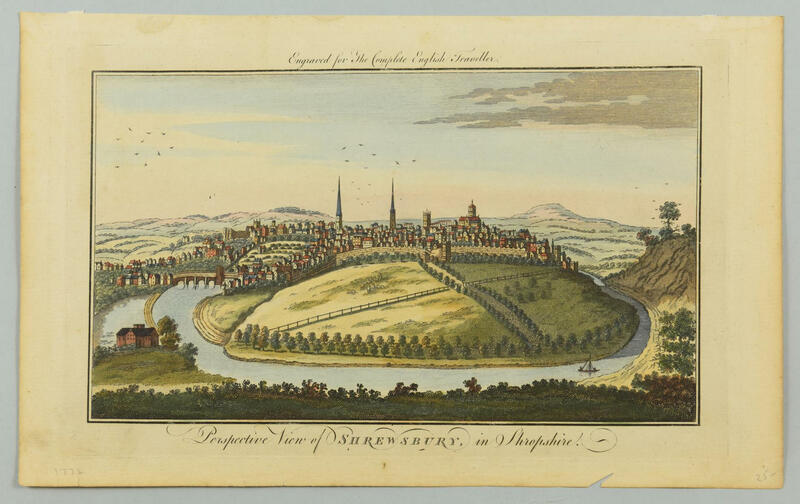 Image – 3 1/4" H x 4 7/8" W. Plate – 3 7/8" H x 5 1/8" W. Sheet – 4 1/4" H x 6" W. 3rd item: "Perspective View of Shrewsbury, in Shropshire. 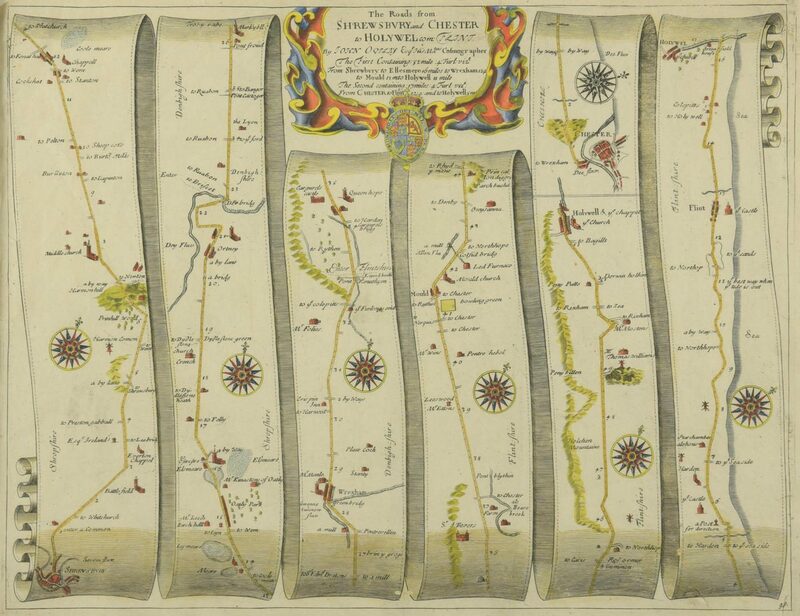 ", from "The Complete English Traveller; or, A New Survey and Description of England and Wales" by Nathaniel Spencer, 1771. 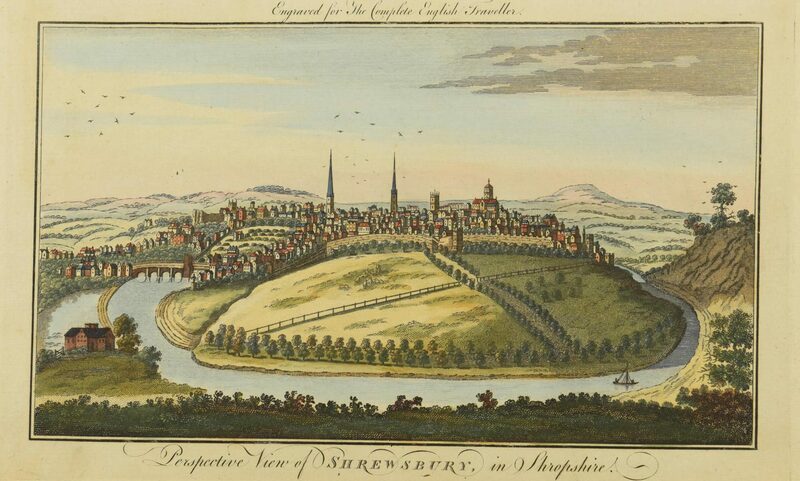 Anonymous copper plate engraving with hand coloring depicting the view of the town of Shrewsbury, as seen from an elevated view. Housed in matte. 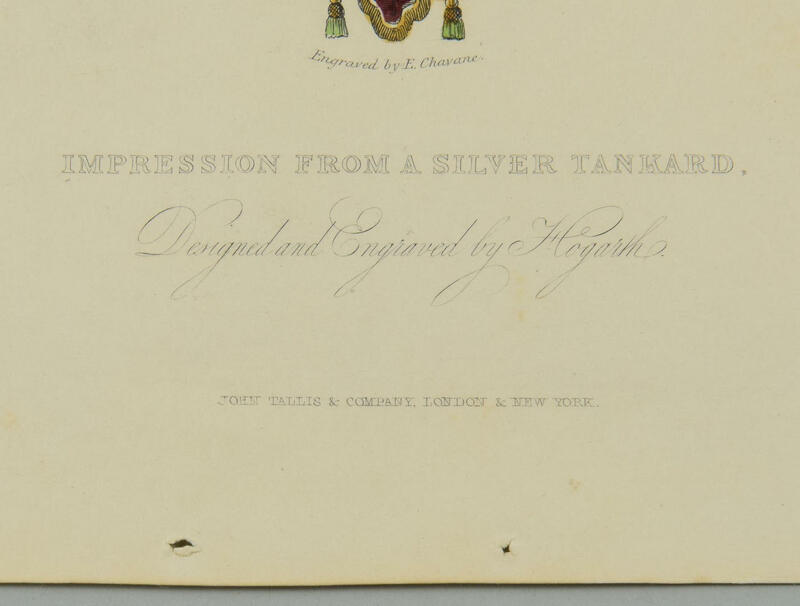 Image – 6 5/8" H x 11 1/4" W. Plate – 7 3/4" H x 12 1/4" W. Sheet – 8 5/8" H x 14" W. 4th item: "Impression from a Silver Tankard. 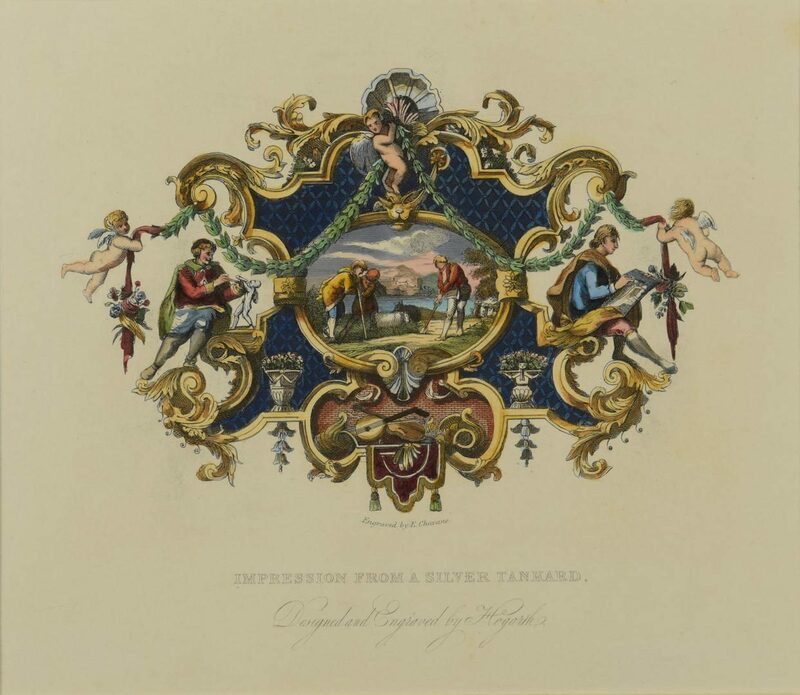 Designed and Engraved by Hogarth. ", engraved by E. Chavane (United Kingdom, active 1832), published by John Tallis and Company, London and New York, circa 1832. 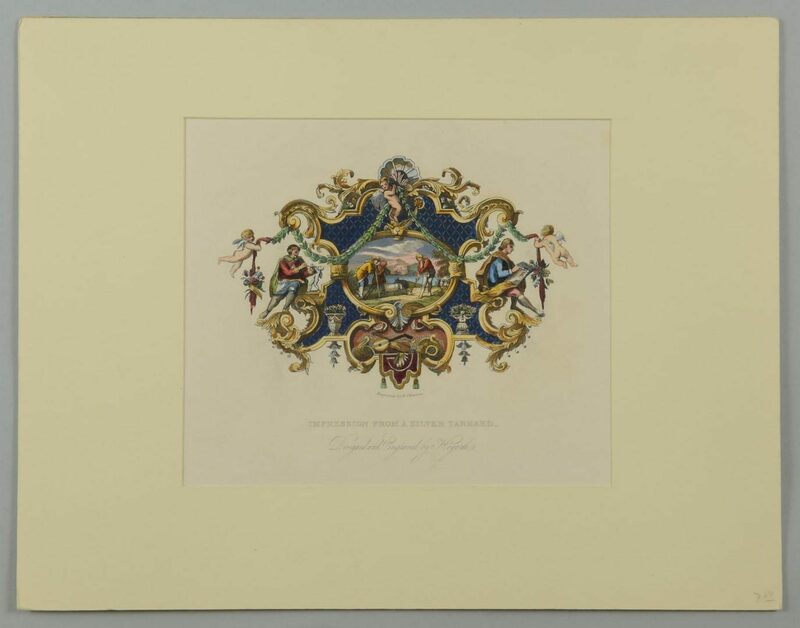 Copper plate engraving with hand coloring depicting a decorative cartouche with three surveyors in the center, flanked by two scholars beneath a floral swag supported by three cherubs. Housed in matte. 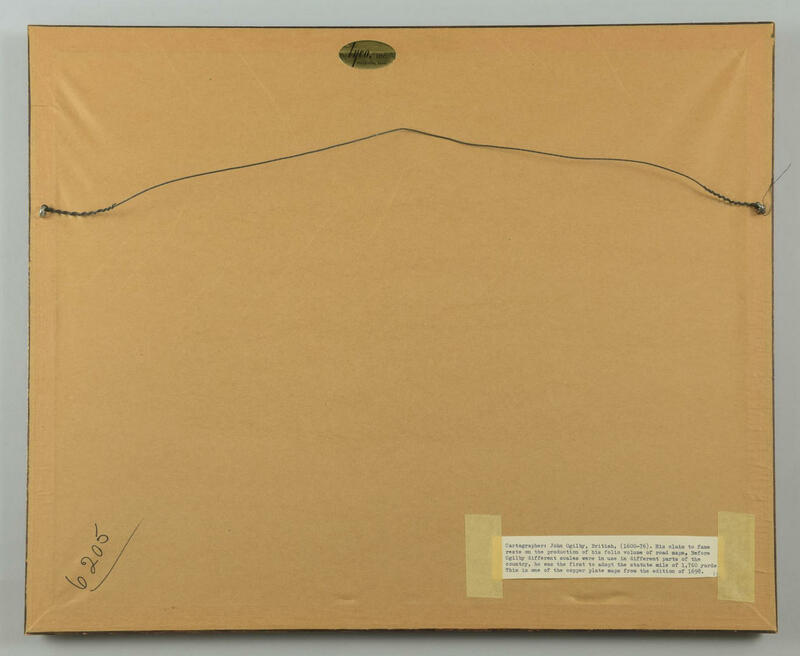 Image – 4 1/4" H x 6 3/8" W. Sheet – 8 5/8" H x 11 1/4" W. Collection of Charles and Ann Wells, Nashville, Tennessee. CONDITION: Scattered tears to edges of paper, including top left corner. Not examined out of frame. 2nd item: Toning lines 1/4" away from image. Ghost marks from old tape, top left and right corners. 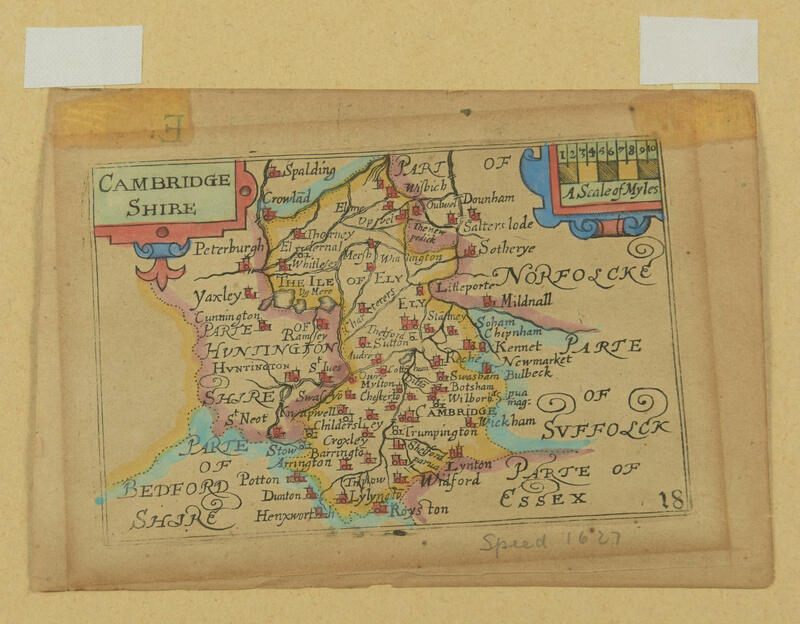 Areas of foxing surround text en verso. 3rd item: Toning around left, bottom, and right edges of paper. Areas of water damage across top, largest 2 3/8" top right. Areas of tape damage across top, largest 3/4" top left. Two tears on bottom edge, largest 3/8" bottom right. 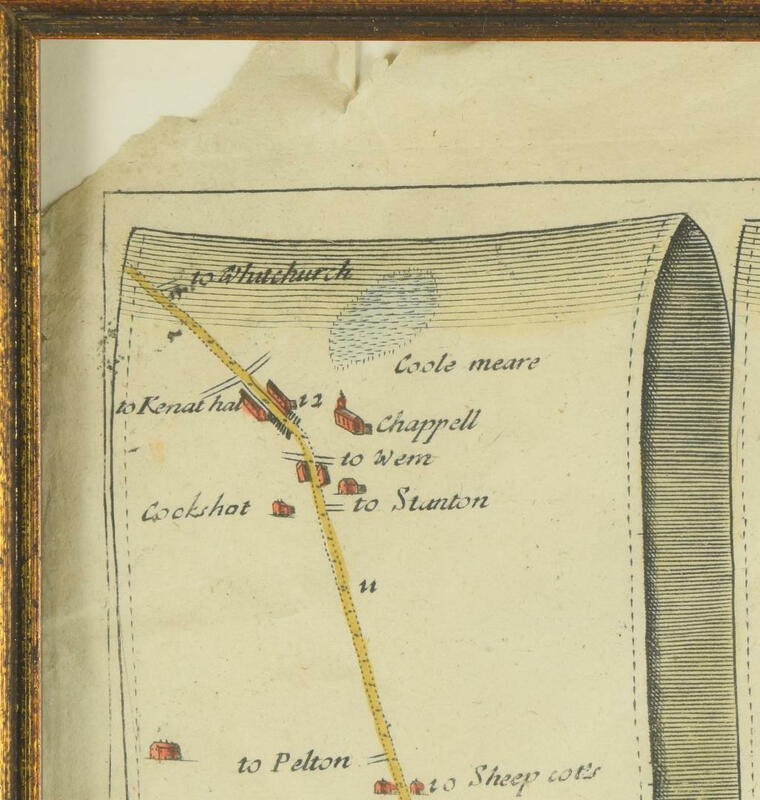 4th item: Numerous foxing and toning spots, largest 1" top right. Three round perforations to page, bottom middle.